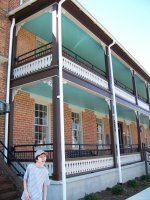 We stopped by the Hoffman Hotel on the way to Pigeon Forge, TN. 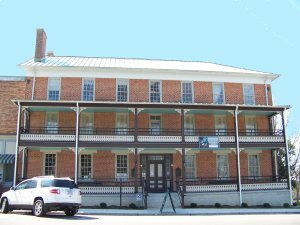 Today, it's no longer a hotel, but the historic building houses the Gaston County Museum. We got to ride the elevator and see the museum. 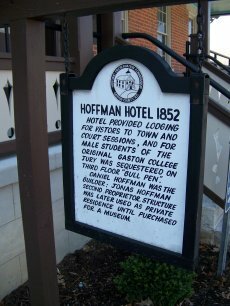 The Hoffman hotel was built in 1852 as a hotel to house travelers and male students from Gaston College. The museum staff was very helpful and friendly. They did allow me to make a video of the elevator, and we took lots of pictures around the outside of the building, including the carriage house. 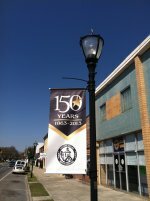 Right down the street is the old railroad station, which now houses the Learning Center for the Museum. They have a very good gift shop as well, with reporoductions of old toys like wooden dice and a schoolhouse chalkboard. 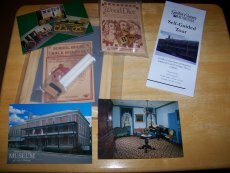 These are just a couple of the items that we got, along with some postcards and other items pictured on the left.